The Networked Society City Index - established through a joint study conducted by Ericsson (NASDAQ:ERIC) and management consultancy Arthur D. Little and presented on May 10 at Ericsson's Business Innovation Forum in Silicon Valley in the US - shows that cities with a high level of ICT maturity are better able to manage issues such as environmental management, infrastructure, public security, health-care quality and education. Erik Almqvist, Director at Arthur D. Little Nordic, says: "Building a Networked Society is one of our time's great challenges for mankind. Although this analysis should be seen as a humble starting point to explore the link between ICT investments and sustainable development, it is our joint hope and intention that this report can serve as inspiration for cities that do not settle for the status quo." The three best-performing cities presented in the index - Singapore, Stockholm and Seoul - have successfully met many social, economic and environmental targets by making extensive investments in ICT. Singapore, for example, is aggressively driving innovation in e-health, and is a pioneer in traffic-congestion management. Stockholm sees ICT as a major enabler for research collaboration and knowledge transfer, while Seoul is using ICT to realize green high-tech initiatives. The index also suggests actions for low-ranking cities, which are encouraged to provide digital access and ICT training for the underprivileged parts of their populations to reduce the digital divide. Mathieu Lefevre, Executive Director of the New Cities Foundation, says: "The 'networked city' is here, and it will significantly impact the life of a growing share of the world's population. 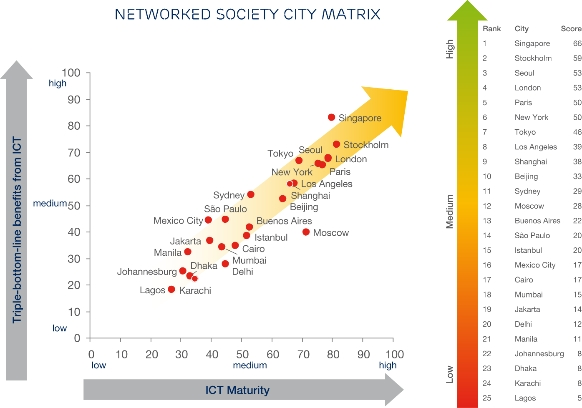 Ericsson - as demonstrated by this important new Networked Society City Index, - has grasped the significance of this mega-trend, and is positioned at the forefront of thinking on tomorrow's urban connected planet." Today, more than 50 percent of the world's population lives in urban areas. By 2030, that percentage is expected to grow to about 60. The number of megacities (defined as cities with 10 million inhabitants or more) is expected to rise to more than 30 by 2030, representing an increase of about 40 percent. As the number of megacities rises, key decision makers will be better able to ensure that this growth is sustainable if they can learn from the successes of top-performing cities in the Networked Society. Erik Kruse, from the Networked Society lab at Ericsson, says: "By providing examples of how ICT can promote a city's growth, the index can be used to inspire dialog with decision makers to use ICT to enable organizational and societal success - from economic, environmental and social perspectives." The top-10-ranking cities in the Networked Society City Index are: Singapore, Stockholm, Seoul, London, Paris, New York, Tokyo, Los Angeles, Shanghai and Beijing. This report is based on secondary and primary information provided by various third parties including but not limited to city authorities and councils. Any use which a third party makes of this report, or any reliance on it, or decisions made or not made based on it, are the responsibility of such third party. Ericsson and Arthur D. Little accept no duty of care or liability of any kind whatsoever to any such third party, and no responsibility for damages, if any, suffered by any third party as a result of decisions made or not made, or actions taken or not taken, based on this document.